Cottesloe Surf Life Saving Club (Cottesloe S.L.S.C) was formed in the spring of 1909. 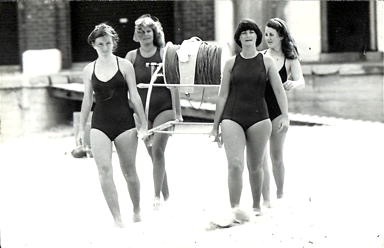 As part of the broader life-saving movement it provided beach safety for the burgeoning sea-side suburb, but fitted the purposes of an athletics club too. Even in the early days, a "beach consciousness" was emphasised, something which reversed the priority given to surf culture in the eastern states. The clubhouse building was completed in 1912, opposite the Hotel Cottesloe, below Forrest Street and Swanbourne Terrace (now Marine Parade), It had two lifesaving reels to service the growing numbers making the day trip to Cottesloe. While numbers grew to over 50 between 1909 and 1914, the outbreak of the First World War meant that the surf club (which was made up of mostly adventurous, athletic young men) suffered its first major test with four-fifths leaving to defend the Empire. A similar situation was repeated for World War Two. The club survived mostly due to the social aspect of galas, functions and swimming carnivals; which featured along-side life-saving, due to the niche it enjoyed in the wider community. Names which were important to the club's early development are; W.G. Smith, Edmund Sullivan, William Lowick, Maurie Olson, Cec Knight, F.J. Medcalf, Jim Paton and Leo Le Quesne. As the surf lifesaving movement grew, Cottesloe was the outstanding club in both the formation of the Western Australian Surf Life Saving Association (1925) and in competition. It did particularly well in Rescue and Resuscitation (R and R) competitions, swimming and surf boat racing. Don Morrison, Johnny Gordon, Jack Hampshire and Noel Unbehaum, amongst others, made the club one of the most successful lifesaving organisations. Collectively, the club has won the state premiership twenty times since competition began in 1926. In 1959 Cottesloe S.L.S.C was granted the land on which its clubhouse is currently built, moving it from the Marine Parade base. While patrols continued during this period, the administration from individuals like Peter Houndslow, Jack Watkins and Eric Hofmaster (after whom some of our patrols are named) contributed to the establishment of other surf clubs. This helped Cottesloe remain competitive with Don Morrison standing out and earning Cottesloe the title of “The Premier Club”. Cottesloe S.L.S.C has always benefited from unusually astute leaders and from gifted members who do well in competition. If you would like a more complete history of Cottesloe S.L.S.C. see Edwin Jaggard's, The Premier Club: Cottesloe Surf Life Saving Club (upon which this account has heavily relied) and The Premier Club: 1984-2009. Copies are available from the office.